The Tzolkin (or "sacred" or "religious") calendar used a 260 day cycle. This calendar was in use throughout mesoamerica, and is not unique to the Maya. It is probably the oldest calendar in their system, and was perhaps the most important. The Maya likely inherited this calendar from preceding cultures. The original purpose of devising such a calendar, with no obvious relation to any astronomical or geophysical cycle, is not known, but there are several suggested sources. A common idea is that the length of the calendar was based on multiplying 13 and 20, which were important numbers to the Maya. Twenty was the basis of the Maya counting system, and was taken from the number of human fingers and toes. Thirteen may have symbolized the number of levels in the Upperworld where the gods lived, or it may be a reference to the number of "joints" in the human body (ankles, knees, hips, shoulders, elbows, wrists, and neck). Another idea is that the 260-day period came from the length of human pregnancy. This is close to the average number of days of gestation. It is also possible that the number 260 was noted as being a repeating pattern for some combination of the above reasons. Humans are good at finding patterns even where none exist. It may be possible that none of the above speculations are correct, and we simply don't know why 260 was chosen as a basis for the calendar. Since the numbered and the named week were running simultaneously, each of their names and numbers change daily. If a day was 3 Cimi, the following day is not 4 Cimi, but rather 4 Manik, and the day after that, 5 Lamat. The next time Cimi rolls around, 20 days later, it will be 10 Cimi instead of 3 Cimi. The next 3 Cimi will not occur until 260 days have passed. This 260-day cycle also had good-luck or bad-luck associations connected with each number/name combination, and was known as the "divinatory year." The Haab was the civil calendar. It consisted of 18 "months" of 20 days each, followed by 5 extra days, known as Uayeb. This gives a year length of 365 days. The Uayeb days were considered bad luck. They were known as "days without names" or "days without souls," and were observed as days of prayer and mourning. Fires were extinguished and the population refrained from eating hot food. Anyone born on those days was "doomed to a miserable life." The length of the Tzolkin year was 260 days and the length of the Haab year was 365 days. The smallest number that can be divided evenly by 260 and 365 is 18,980 days, or 52 Haab years. This period was known as the Calendar Round. The 'New Years' days of the Tzolkin and Haab calendars fell on the same day once every 52 years. 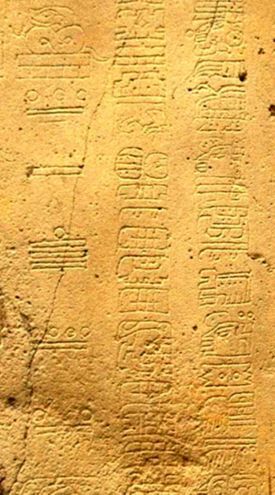 This became a date of importance to the Maya, and the number 52 also became very important to them. Scholars have found a large numerical table of multiples of 52 in the Dresden Codex. Every 52 years the Maya extinguished all of the fires in their households and threw away all their clay utensils. Then they “renewed” their social life by bringing a new fire (el fuego nuevo) from a central location into all the villages and cities. The 'Calendar Round Date' consisted of the Tzolkin day number, followed by the Tzolkin day name (remember, these cycle with different period lengths), followed by the Haab date (day number followed by month name). An example might be 4 Ahau 8 Cumku which would be followed by 5 Imix 9 Cumku. The next time a day falls on 4 Ahau 8 Cumku would be 18,980 days or 52 Haab years later. You can see today's date in the Maya calendar by going to this link. With one exception, the calendars did not 'synchronize' with each other on an annual basis. Because the named Tzolkin week is 20 days long, and the smallest Long Count digit is 20 days, the smallest Long Count digit also represents the Tzolkin named day. For example, the last digit of today’s Long Count is 0, today is Ahau; if it is 6, it is Cimi. However the Long Count does not synchronize to the Tzolkin or Haab in any other way. As noted above, the length of the Tzolkin and Haab formed the length of the 'Calendar Round' cycle when multiplied together. So the Calendar Round formed a repeating pattern on a 52 Haab year cycle. The Long Count was given as a 'distance' date, indicating the number of days since the date of creation in their mythology. As a result, it is inevitable that it would occasionally reach round figures. Most of the time that proponents of the 2012 hoax reference pictures of "the maya calendar" they show a picture of the Aztec sun stone instead. Even the cartoon to the right commits this error. Despite the fact that the Maya Haab is less accurate when compared to the solar year than the Julian calendar is, and much less accurate than the modern Gregorian calendar , some people are using the supposed accuracy of the Maya calendar to claim that they obviously had everything right, where our modern calendar has it wrong. We have seen outrageous claims made about the accuracy of the Maya calendar: that it kept in perfect sync without "leap" days, that it is more accurate than the modern calendar, that it kept perfect time over thousands of years. This is bunk. Claims of accuracy and precision are specious because they are comparing apples and oranges. The Gregorian calendar is primarily a solar calendar. The Haab was primarily a solar calendar. The Tzolkin, 'Calendar Round' and 'Long Count' calendars are not solar calendars. We will compare the modern Gregorian calendar with the Haab and see just how accurate it was. It would be nice if things were different, and there were exactly an even number of days per lunar phase, and an even number of lunar phases per year, but that's just not how it is. How did the Maya resolve this disconnect between the Haab or 'civil calendar' and the solar year? Apparently it was the duty of the Jaguar Priests to tell the Maya when to plant crops, etc. There have been about 514 Leap Years since Caesar created it in 45BC. Without the extra day every 4 years, today would be July 28, 2013. 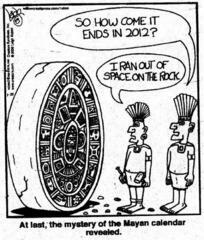 Also, the Mayan calendar did not account for leap year…. so technically the world should have ended 7 months ago. This message has been repeated thousands of times on Twitter, YouTube and numerous discussion forums. However, there are a number of problems with it. Firstly, as we have said on this page, the Maya did not use leap years for the reason that they were not attempting to keep exactly in step with the solar year. This has been well known ever since their calendars were first researched more than a century ago. Secondly, the December 2012 date depends on the Long Count which is a count of days and is a different calendar from the approximately seasonal Haab. Thirdly, it doesn't really matter whether any calendar is 'right' or 'wrong' or has been modified. What's important is that we know how it works and know the rules for arriving at a particular date. So we know when the Long Count began and how it counts forward. We know how the Gregorian calendar works and how many leap years it has. Thus we can count forward 13 baktuns of 144,000 days each, totalling 1,872,000 days, starting from 11th August 3114 BCE. Taking into account all leap years, we arrive at a date of 21st December 2012.